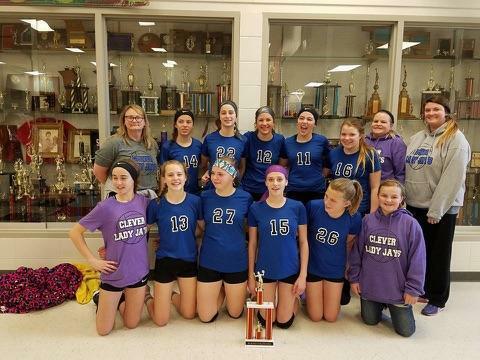 The Clever Junior High 2017 Volleyball Team had a very exciting season with a record of 19-1. They also claimed the SWCL championship title and the southwest championship. They beat almost every team in two sets. Brandi Riley, Kendra Hancock, Shelby Volmert, Abbigail Vanzandt, Kendra Stewart, Kylie Wenger, and Kenna Wise are the teammates that contributed to all of these phenomenal wins.